Iran says Egypt must guard against "enemy opportunism"
DUBAI, July 4 (Reuters) - Iran on Thursday gave a guarded response to the army's removal of Egypt's Islamist president, Mohamed Mursi, calling for the people's "legitimate demands" to be fulfilled and warning of "foreign and enemy opportunism". Iran welcomed the popular overthrow of Hosni Mubarak in 2011 as part of an "Islamic awakening" and has sought to repair its strained ties with Egypt since Mursi's election victory last year. Mursi visited Tehran on one of his first official trips abroad, but the two countries have found themselves supporting opposite sides of a civil war in Syria that has taken on increasingly sectarian overtones. Largely Sunni Muslim Egypt under Mursi voiced its support for mostly Sunni rebel groups seeking to overthrow President Bashar al-Assad, Shi'ite Iran's closest Arab ally. "Certainly the resistant nation of Egypt will protect its independence and greatness from foreign and enemy opportunism during the difficult conditions that follow," Fars new agency quoted Foreign Ministry spokesman Abbas Araqchi as saying. "With respect for the political origins of its (Egypt's) discerning, civilised and historic people, the Islamic Republic emphasises the need to fulfil their legitimate demands and is hopeful that ... developments will provide an atmosphere to meet their needs," Araqchi said. The statement was a good deal more equivocal than before Mursi was deposed. On Tuesday, an Iranian official said the Egyptian president had been elected by the will of the nation and called on the armed forces to "take heed of the vote of the people". DUBAI, July 4 (Reuters) - Qatar's new emir congratulated Egypt's Adli Mansour on Thursday after he was sworn in as an interim leader following the ousting of Islamist President Mohamed Mursi, an ally of the Gulf Arab country, state news agency QNA reported. Qatar was alone among Gulf Arab states in celebrating the 2011 Arab Spring revolt that toppled former President Hosni Mubarak, a foe of Iran and a longtime ally of the hereditary states that sit on nearly a quarter of the world's oil reserves. The small, energy-rich country provided billions of dollars in aid to Egypt following the ousting of Mubarak. QNA said the emir, Sheikh Tamim bin Hamad Al Thani, "sent a cable of congratulations" to the head of Egypt's Supreme Constitutional Court on the occasion of his taking the oath as an interim president. The agency and Qatar-owned al Jazeera television had earlier quoted a foreign ministry source as praising the Egyptian army's role in safeguarding Egypt's national security and said the Gulf Arab state respected the will of the Egyptian people. Qatar has been a major financier of the Islamist groups around the Arab World, including Egypt's Brotherhood. In addition to financial aid, the Gulf state had donated fuel cargoes over the past year to support shortages in the country. Qatar's allies in the six-member Gulf Cooperation Council, including Saudi Arabia, the United Arab Emirates, Kuwait and Bahrain had earlier sent congratulatory messages to Mansour. First off, the attribution of the word “coup” is misleading as the Morsi government had become effectively unable to govern after the mass protests of June 30th and promise of further civil disobedience. It is important to note that the army contacted all major religious and political groups, including the FJP, in order to seek consensus on a way forward, but the government stubbornly ignored the main demand of the protestors to hold immediate elections by claiming political legitimacy. In any western democracy, such public discontent would lead to governments resigning and fresh elections being held, but the MB had effectively neutralized any legal way for such an event to occur, other than at their own instigation. Their intransigence led to the military’s actions yesterday. As for the MB’s claim to legitimacy, the British social theoretician John Locke once wrote ““The argument of the [Second] Treatise is that the government is not legitimate unless it is carried on with the consent of the governed.” Clearly, the size of the Tamaroud movement (by some estimates over 30 million people protested against Morsi on June 30th) indicates that Morsi’s government, and by association the FJP, has lost legitimacy with the majority of the Egyptian electorate and therefore their claims to political legitimacy ring hollow. Head of Iran’s parliamentary committee on national security and foreign policy, Alaeddin Boroujerdi, gave his reaction to the removal of Egyptian president Mohamed Mursi, saying the Muslim Brotherhood had made “mistakes”, Iran’s student news agency (ISNA) reported. The events of last night “led to a soft coup d’etat which the army took advantage of using its capabilities,” he added. ADDIS ABABA, July 4 (Reuters) - The African Union is likely to suspend Egypt from all its activities after the Egyptian military suspended the constitution and overthrew the elected president, Mohamed Mursi, a senior AU source said on Thursday. The source, who asked not to be identified, told Reuters that members of the AU's peace and security council would meet on Friday and were likely to implement the AU's usual response to any interruption of constitutional rule by a member state. "The belief is that the doctrine will be applied, which is suspension for any country where an unconstitutional change has taken place," he said. In the March, the AU also suspended the Central African Republic after rebels overthrew the government there. Ramtane Lamamra, the AU Commissioner for Peace and Security Council, told Reuters in the Ethiopian capital where the AU is based that the council would discuss Egypt's situation at the Friday meeting. "We intend to dispatch a mission and urge the Egyptian authorities to establish dialogue," Lamamra said. DUBAI, July 4 (Reuters) - Qatar's new emir congratulated interim Egyptian leader Adli Mansour on taking office, official media said, after the military overthrew elected President Mohamed Mursi, an Islamist whose government received backing from Gulf Arab state. The official Qatar news agency reported on Thursday that cables of congratulation had been sent to Mansour by Sheikh Tamim bin Hamad al-Thani, who acceded to power last week when his father stepped down, and Qatari Prime Minister Sheikh Abdullah bin Nasser al-Thani. what will be the end result if new in President adopts the same path of Egyptian majority as that Of Morsi,should internationalplayers allow him to carry on are pack him also and then who will dare to lead a nation moderate Islamic country? CAIRO, July 4 (Reuters) - The Egyptian pound edged stronger at a central bank foreign exchange auction on Thursday, a day after the military ousted the country's president, a banker said. The central bank sold $38.8 million to banks at the auction, with the cut-off price at 7.0184 pounds to the dollar compared to 7.0189 pounds at Wednesday's auction, the banker said. On the black market, the pound weakened, with one dealer offering to sell dollars for 7.65 pounds and buy dollars for 7.60 pounds, compared to 7.55 and 7.50 on Wednesday. It was the first time the currency has strengthened on the official market since the central bank introduced the auctions at the end of December to help stave off a currency crisis and thwart a run on the pound. Since then, the bank has allowed the currency to lose almost 12 percent of its value on the official market. BRUSSELS, July 4 (Reuters) - A European Union official said on Thursday he did not know of any plans for the bloc to change its aid programmes for Egypt after the army ousted President Mohamed Mursi. "I am not aware of any urgent plans to rethink our aid programmes at the moment but ... the dust is still settling on what happened last night," Michael Mann, a spokesman for EU foreign policy chief Catherine Ashton, told reporters. Mann avoided repeated questions on whether the EU considered what had happened in Egypt to be a military coup. CAIRO, July 4 (Reuters) - The Egyptian prosecutor's office ordered on Thursday the arrest of the Muslim Brotherhood's top leader, Mohamed Badie, and his deputy Khairat el-Shater, judicial and army sources said, after the military overthrew President Mohamed Mursi. Shater, a wealthy businessman seen as the Brotherhood's top political strategist, was the group's first choice candidate to run in last year's presidential election. But he was disqualified from the race due to past convictions, forcing Mursi to take his place. Shater and Badie were ordered arrested on accusations of inciting violence in which at least eight people were killed outside the Brotherhood's Cairo headquarters earlier this week. CAIRO, July 4 (Reuters) - Egypt's main alliance of liberal and leftist parties said on Thursday it opposed excluding any Islamist parties from political life after the military-backed authorities arrested Muslim Brotherhood leaders and shut down Islamist-run media. "We confirm our strong belief in the right of all political groups to express their opinions freely, and to form their own political parties," the National Salvation Front said in a statement. "We totally reject excluding any party, particularly political Islamic groups," it added. "What Egypt is witnessing now is not a military coup by any standards. It was a necessary decision that the Armed Forces' leadership took to protect democracy, maintain the country's unity and integrity, restore stability," it added. CAIRO, July 4 (Reuters) - Egypt's air force staged several fly pasts in a smoggy Cairo sky on Thursday minutes before the country's interim leader was sworn in, in a vivid reminder of the military's role in ousting Mohamed Mursi as head of state. Fourteen jets in V-formation blazed over downtown Cairo shortly before Adli Mansour, chief justice of the constitutional court, became interim president. Nine more jets then flew at low altitude, leaving a trail of red, white, and black smoke behind them to signify the colours of the Egyptian flag. A formation of propeller planes buzzed overhead in a stunt likely to prove popular with many Egyptians who have cheered the military's decision to step in and remove Mursi after millions of people took to the streets at the weekend calling for his resignation. 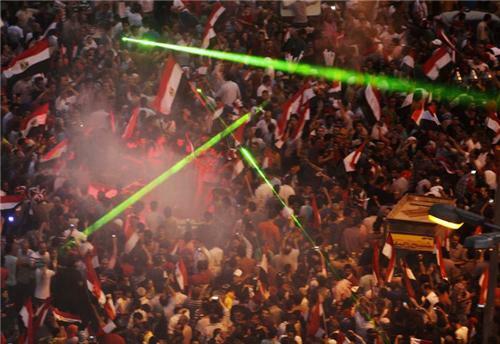 Hundreds of thousands of people partied late on Wednesday in Cairo's Tahrir Square after the army announced it had toppled Mursi. They chanted pro-army slogans and cheered gleefully as army helicopters flew past trailing Egyptian flags behind them. State news agency MENA reported early on Thursday that the air force would stage a performance in the Cairo skies to "celebrate the triumph of popular will." CAIRO, July 4 (Reuters) - Egypt's new head of state said the Muslim Brotherhood were part of the people and were welcome to help "build the nation" a day after the military overthrew president Mohamed Mursi, the website of the state-run Al-Ahram newspaper reported. President Adli Mansour made the comments to journalists after being sworn in as the interim head of state at the Supreme Constitutional Court in Cairo. "The Muslim Brotherhood group is part of this people and are invited to participate in building the nation as nobody will be excluded, and if they responded to the invitation, they will be welcomed," he said. CAIRO, July 4 (Reuters) - The Egyptian prosecutor's office ordered on Thursday the arrest of the Muslim Brotherhood's top leader, Mohamed Badie, and his deputy, Khairat el-Shater, judicial and army sources said, after the military overthrew President Mohamed Mursi. UNITED NATIONS, July 3 (Reuters) - U.N. Secretary-General Ban Ki-moon on Wednesday appealed for calm and restraint in Egypt, as well as the preservation of rights such as freedom of expression and assembly, after the country's army overthrew Islamist President Mohamed Mursi. "Many Egyptians in their protests have voiced deep frustrations and legitimate concerns," he said in a statement that did not condemn the Egyptian armed forces' ouster of Mursi. "At the same time, military interference in the affairs of any state is of concern," he said. "Therefore, it will be crucial to quickly reinforce civilian rule in accordance with principles of democracy." ALEXANDRIA, Egypt, July 3 (Reuters) - At least 14 people were killed when opponents and supporters of Egypt's deposed president, Mohamed Mursi, clashed after the army announced his removal on Wednesday, state media and officials said. Eight of those reported dead were in the northern city of Marsa Matrouh. Al-Anani Hamouda, a senior provincial security official, said two members of security forces were among those killed in the clashes. Three people were killed and at least 50 wounded in the Mediterranean city of Alexandria, state news agency MENA reported. Gunfire broke out as rocks and bricks flew during the fighting, witnesses said. One of the city's dead was a woman stabbed in the stomach, MENA said. The other two were men hit by birdshot. Dozens more were wounded in Fayoum, south of Cairo, where unidentified assailants broke into the local offices of the Freedom and Justice Party, the Brotherhood's political wing, MENA said. The attackers looted the headquarters and set them on fire, it said. REUTERS: Egypt state-run Al-Ahram paper quotes presidency source saying the army told Mursi at 7 pm (17:00 GMT) that he was no longer president. Egypt's army deployed tanks and troops close to the presidential palace in Cairo on Wednesday after a military deadline for Islamist President Mohamed Mursi to yield to street protests passed without any agreement. Read the full report by Tom Perry and Maggie Fick here. Egypt's army has taken control of the country's state TV building amid the expiration of a 48 hour deadline for Islamist President Mohamed Mursi to share power. Rough Cut (no reporter narration). Stage at pro- #Morsi sit in in Rabaa Adawiya leads crowd in chant of "say it, don't be afraid, Sissi has to leave!" Military's deadline has passed in #Egypt and heavy waiting continues for army's meeting to end w/national figures. Nerve wracking. Huge roar from pro-Morsi crowd when announced that katatni & other mb leaders refused to meet army. "we won't negotiate under threat!" Human Rights Watch Executive Director Kenneth Roth tweets Egyptian police are "abdicating their duty to protect protesters and stop violence." Read the full report here: With ongoing chaos and violence in Egypt, where are the police? Egyptian activist Wael Nawara argues in Al Monitor that the Muslim Brotherhood's restrictive cultural policies are the driving force behind the protests. It's not the economy, stupid. It is not just about the fuel shortages, power outages, deteriorating economy or soaring prices. Western media rarely, if ever, mention the Muslim Brotherhood's assault on Egyptian identity, culture and way of life as a core cause of protests. Could something so intangible motivate such massive demonstrations? The political wing of Egypt's ruling Muslim Brotherhood refused an invitation to meet the armed forces commander on Wednesday, hours before an army deadline for Islamist President Mohamed Mursi to yield to mass protests or quit, military and party sources said. "We do not go to invitations (meetings) with anyone. We have a president and that is it," said Waleed al-Haddad, a senior leader of the Freedom and Justice Party told Reuters. Egyptian troops with armoured vehicles have secured the central Cairo studios of state television on Wednesday, security sources said. As a deadline approaches when the army high command is expected to step in and reorder Egypt's political institutions, the sources said staff not involved in working on live broadcasts had left the building. Armoured army vehicles guard the Egypt state TV building, while staff not working on live productions have left, according to security forces. Egyptian liberal opposition leader Mohamed ElBaradei met army chief General Abdel Fattah al-Sisi on Wednesday hours before an army deadline for Islamist President Mohamed Mursi to yield to mass protests or quit, two political sources said. The heads of state Islamic institute, Al-Azhar, and the Egyptian Coptic Church also joined the meeting, a government source said. Political sources said two members of the "Tamarud - Rebel!" youth group that is leading the anti-Mursi protests also attended, as did members of the hardline Muslim fundamentalist Nour Party. Al-Azhar's Grand Sheikh, Ahmed al-Tayeb, endorsed the army's position, calling on political leaders to heed anti-government protesters. Pope Tawadros, spiritual leader of some 10 percent of Egypt's 84 million people, tweeted his blessing for the anti-Mursi revolt on Tuesday. ElBaradei was chosen to represent the opposition National Salvation Front coalition and youth groups leading anti-Mursi street protests to negotiate with the army on their behalf. "In the meeting, ElBaradei will urge the armed forces to intervene to stop the bloodshed," one opposition source said. A military source denied the meeting was taking place. More than 20 people have died and hundreds have been injured in clashes between Mursi's supporters and opponents since the eruption of mass protests on June 30. Three people were killed and about 90 wounded in clashes near Cairo University between supporters of President Mohamed Mursi and security forces, an aide to Egypt's health minister told Reuters. Witnesses heard shotgun and rifle fire and teargas enveloped the area. Television pictures showed ambulances taking away casualties, small fires burning and hundreds of men, many with the beards typical of Mursi's Islamist supporters, some of them weeping and others chanting slogans. Some held up rifle and shotgun cartridges to the camera. Another man waved his bloodied hand. CAIRO, July 2 (Reuters) - Egyptian President Mohamed Mursi called on the armed forces on Tuesday to withdraw an ultimatum for him to share power with his political opponents and said he would not be dictated to. "President Mohamed Mursi asserts his grasp on constitutional legitimacy and rejects any attempt to deviate from it, and calls on the armed forces to withdraw their warning and refuses to be dictated to internally or externally," a tweet on the official Twitter feed of the Egyptian presidency said. 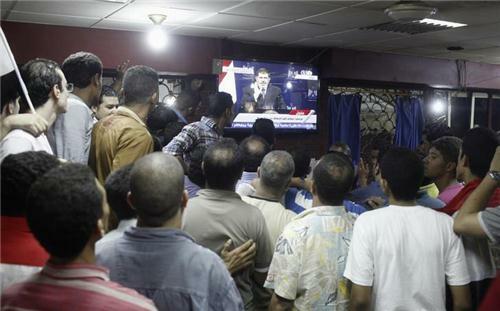 A military source said the armed forces had seen Mursi's statement and would issue a response to it.